Installing energy efficient Andersen windows is a simple way to lower monthly energy bills. 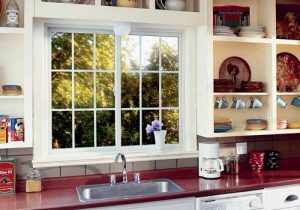 Each Andersen window is designed to limit the amount of energy needed to keep your home bright and comfortable. Using the exclusive Fibrex material, Andersen creates doors and windows that keep costly energy trapped inside their home. “Low-E” glass, which limits penetration of both UV and IR light, works with Fibrex to help homeowners get a superior level of energy efficiency from Andersen products. Renewal by Andersen is the leading manufacturer of energy efficient windows and doors in the U.S., and upon installation their products go to work to save homeowners on monthly energy bills. But the energy efficiency begins in the production stage. The Andersen manufacturing processes themselves are performed in environmentally responsible ways, using recycled materials and never wasting what need not be wasted. The prime example of Andersen’s efficient manufacturing process is the production of Fibrex material. This wood grain and thermoplastic polymer is more sustainable than any vinyl or fiber cement material available. It is even efficient in the manufacturing stage. Any excess material from one production gets recycled right into the next one. That way, factories don’t have to dispose of waste materials in landfills like the majority of manufacturers who create vinyl products. If you are a homeowner in the Atlanta area who needs to lower their monthly energy bills, turn to Renewal by Andersen of Atlanta for new windows. We will help you to choose the right style from our wide selection of Andersen windows, custom fit your windows to your home, and leave you with a more beautiful, valuable, energy efficient home. And for even further energy efficiency, ask about our selection of efficient entry doors. To receive a FREE estimate and in-home consultation with our local window and door experts, give us a call or fill out our Request an Appointment form.